Book your Dunn's River Falls and Glistening Waters Luminous Lagoon Tour from the Grand Palladium Resort or Lady Hamilton Resort. This is one of the most exciting experience while staying in Jamaica. Be picked up at your resort in our fully air conditioned vehicles, drive along the cost line to for the experience of a life time. This famous 600 feet cascading splendor, located in the parish of St. Ann, Ocho Rios. 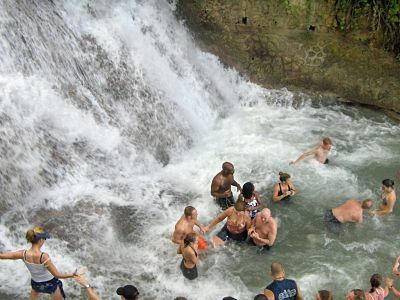 Dunn's River Falls Attraction offers an experience that cannot be beat, boosting the most visited attraction in Jamaica, climb from the beach to the top. If you are up to the challenge, stopping to enjoy a plunge in one of the many pools formed naturally by the cascading crystal clear water, a job well done. The Dunn's River Falls experience is a once in a lifetime adventure you will treasure for a lifetime, you may also shop for souvenirs at the Craft Market. The park is an ideal spot for relaxation and fun for the entire family. For those that enjoy relaxing in the sun; the beach is located at the base of the falls where the River meets the beautiful Caribbean sea. Let us take you on a scenic evening sightseeing ride to the Glistening Water Iluminous Lagoon. 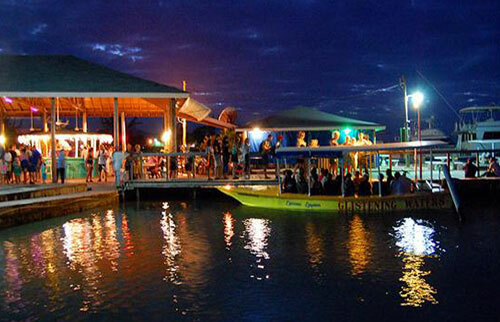 At the Glistening Waters you will enjoy a relaxing evening boat tour to see the amazing natural phosphorescence waters that illuminates by your touch. If you take a swim, your whole body will glow in the dark and experience a phenomenal sensation. It is said that if a male dives in the Glistening waters he will come out two times the size he went in, wouldn’t you like to find out. After your experience is over our driver will take you back to your destination, this is a romantic getaway for the lovers at heart. Included: Complimentary round trip transfer, Dunn's River Falls and Glistening Waters Luminous Lagoon fee.